Sen. Jeff B. Sessions was confirmed on Wednesday, capping a rocky confirmation process in which Senate Democrats were eager to scuttle his nomination. Sen. Jeff B. Sessions (R-Ala.) was confirmed on Wednesday to be the next attorney general of the United States, capping a rocky confirmation process in which the senator’s commitment to civil rights was questioned by Senate Democrats eager to scuttle his nomination. Following the vote, Sessions told reporters that he was happy with the way his confirmation had proceeded. I appreciate the friendship from my colleagues – even those who, many of them who didn’t feel able to vote for me. They were cordial, and so we continue to have good relations and will continue to do the best I can. Sessions’ confirmation was not without acrimony. Sen. Elizabeth Warren (D-Mass. ), whose reading of a decades-old letter by Coretta Scott King – in which the civil rights icon voiced opposition to Sessions’ ultimately failed 1986 nomination to a federal judgeship – earned the senator a rare and stinging rebuke from Senate Majority Leader Mitch McConnell. McConnell invoked an arcane rule against senators impugning the character of another senator in a successful effort to keep Warren from speaking further. 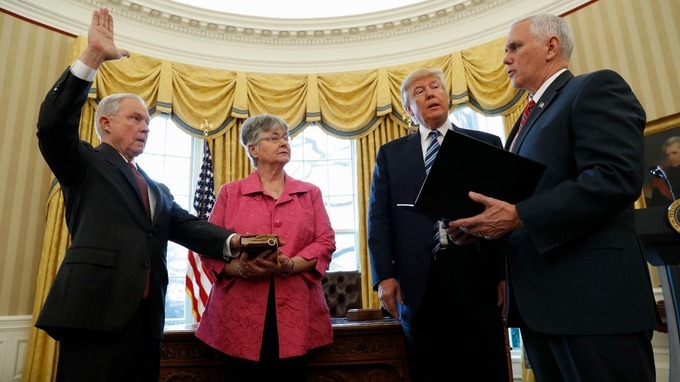 Sessions was sworn in Thursday morning in the Oval Office. President Donald Trump welcomed Sessions in brief remarks to the press. He has devoted his life to the cause of justice and believes deeply that all people are equals in the eyes of the law – and very importantly for Jeff and so many of us also in the eyes of God. Sessions’ past statements on the issue of cannabis indicate that he is not an ally in the cause of cannabis legalization. Sessions in 2014 lambasted then-President Barack Obama over comments in which the president claimed that use of cannabis was no more harmful than the use of alcohol. Sessions’ confirmation vote, while not unexpected, nonetheless garnered sanguine reactions within and without the cannabis community. Justin Strekal, the political director for NORML, released a statement Wednesday in which he attacked Sessions’ views as being “out of step with mainstream America” and said that his organization would be unflinching in its defense of cannabis rights. We will never stop fighting for further marijuana reforms at the state level and much needed federal policy changes. With Americans throughout the country organizing and taking action, the fight for cannabis freedom will continue with renewed energy.